Choosing the right eyelash extension glue can be tough. There seem to be so many on the market that promise the world, but many don’t seem to measure up. When using an eyelash adhesive, especially for individual lashes, you need to make sure the product you are using is reliable and durable. Long retention time is a must, what is the point of applying new lashes only to have to touch them up in a week? Along with retention time and durability, you need a product that is considerate to your eyes and skin. There are more than enough quality products out there that don’t contain latex and formaldehyde, and these should be the products you are looking at, to save yourself or your clients from unnecessary irritation and allergies. The loss of these two ingredients does not in any way reduce the effectiveness or hold of the eyelash adhesives. It is best to figure out what is important to you when applying individual lashes and base your search from there. To save you some time, however, here are the top picks for eyelash glues for individual lashes. When applying individual lashes, you don’t want a glue that doesn’t hold. It needs to withstand anything that gets in your way, and that is exactly what the Flow Lash Extra Strong Hold Eyelash Extension glue promises. It is used by professionals all around and has stood the test of time. It is one of the strongest and long-lasting eyelash glues on the market and keeps eyelash extensions in place for up to 8 weeks. To make it an even better glue to use, it has been formulated to be quick drying, with a record time of drying in 1.5 seconds, because who has time to sit around and wait? It is completely formaldehyde and latex free, making it perfectly safe to use for most people. The glue is black in color, blending in well with your new, luscious lashes. The common ingredients that have been left out of the glue, due to having irritant qualities, do not in any way compromise the bonding and strength of the glue. This really is an eyelash extension glue to try, long lasting and great hold, if the professionals use it, then surely you should as well? This pretty little bottle comes with a punch. Eyelash extensions are held in place much longer than when using regular eyelash glue and will save you some trips to the salon trying to patch up any missing spots. The Infinit Eyelash Extension Glue keeps lashes firmly in place for up to 7-8 weeks, giving you enough time to enjoy your extensions before touching up again. The adhesive is super quick drying, with an expected dry in 2-3 seconds. The glue offers consistency during application, leaving you with a flawless finish. To avoid any waste or spillage, the bottle has been built with a special nozzle that features a double blocking system. This prevents any glue from leaking from the bottle and coming into contact with air. It preserves the glue and extends its lifespan even further. All ingredients have been salon tested, and are of the highest quality. Formaldehyde and latex free, you know you are using a safe product. For reliability and professional results, this is a good product to test out. It is used by many professionals, so it should stand up to your high standards as well! 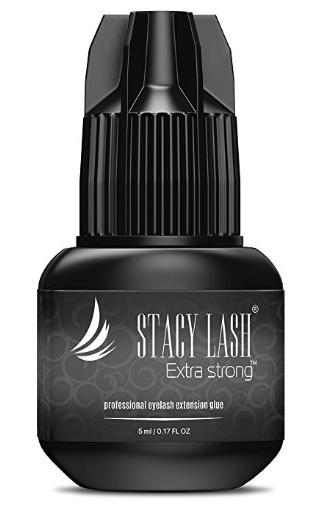 Extra strong is not just a little slogan splashed onto the front of this adhesive label, it is legitimately one of the strongest eyelash adhesive glues you will find. The retention power has been extended with the new advanced formula, and the extension can stay put for up to 7 weeks. For advanced lash extensions, this is the glue you need. For such long-lasting glue, the drying time is super short. With a drying time of only 1-2 seconds, you can get the lashes you desire in no time. The formula is latex free but is not entirely suitable for sensitive eyes. It should preferably be used by professionals or those who know how to apply lashes quickly. The product dries black, blending in with your eyeliner and lashes. For a more professional glue, this is a good choice. Just make sure you know what you are doing and you should land up with some stunning lashes! Beau Lashes consider themselves leaders in the industry when it comes to performance. 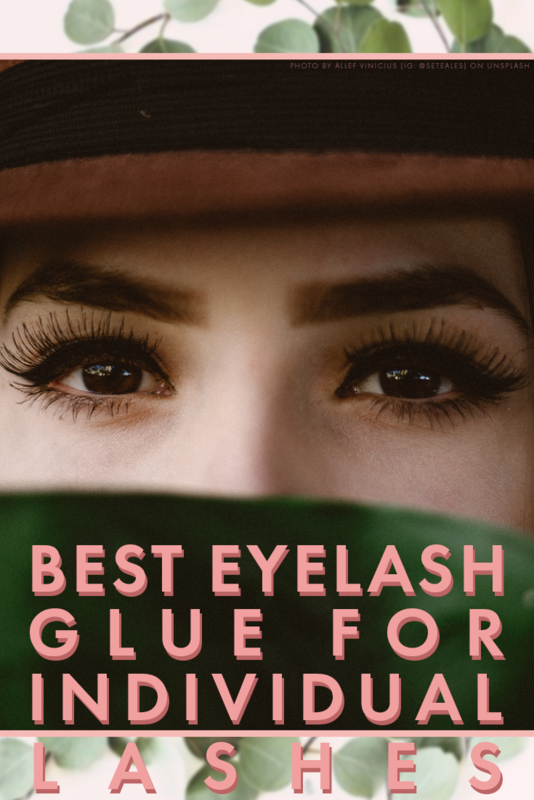 Their Eyelash Extension Glue is made for professionals and salon use, but if you are confident in your lash application, you should be able to pull it off at home. The super quick drying glue has one of the longest retention times, lasting up to 7 weeks. The glue can be used for both classic and volume lash extensions, giving you a variety of use. The bottle is re-sealable and extra silica helps keep the contents fresh and moisture-free. Reliability is a must when using eyelash adhesive, and that is what Beau Lashes pride themselves on. The drying time is only 1-2 seconds, but the last is long and the dry color of black allows for the lashes to blend in well. It is latex and formaldehyde free, making it great to use on all skin and eye types. Quality, performance, reliability, and safety all sum up this great eyelash adhesive that won’t let you down! Use it for clients or professionally on your own and you won’t look back. If you find that your eyes tend to react badly or are sensitive to other eyelash adhesives, the Lonris Maximum Sensitive Eyelash Glue might be your answer. It is fume free and odorless, containing non-irritating ingredients. It was formulated specifically to reduce potential allergies or irritation, especially for those who have sensitive eyes. Being latex and formaldehyde free, it should not cause any irritation and can even be used on lower lashes. The glue is sealed with silica, extending its life span and keeping the quality of the product intact. It has a slightly longer drying time of 6-7 seconds, but this could be a great help if you are applying lashes at home, as it gives you time to perfectly place each lash. While the lasting time is a little shorter, only 3-4 weeks, it is worth using for those who simply cannot stand ordinary eyelash glue. Rather have a shorter last time with a sensitive glue than sore, itchy eyes that won’t go away! With the L’Origine Eyelash Glue, you don’t have to worry about any hiccups or mishaps with the glue, instead, spend your time perfecting beautiful lashes. The L’Origine Glue is a great performing adhesive that gives the best service to you and clients. It dries in only 1-2 seconds, saving you time on the application. Beautiful lashes in no time. The retention of the glue is 7-8 weeks, leaving your lashes on for longer. When dry, the adhesive has a deep black color, making them look as natural as possible. No clumpy bits to give away your lash secret. The adhesive is latex and formaldehyde free, strictly in line with ITQA and ISO approval. There is no fragrance, gluten or sulfates, and the adhesive is BPA free. What makes this such a great choice is that it is double the quantity of most other glues, but for the same cost. It is a great value and a great performing product. This is a safe and reliable product that will leave you and your lashes happy and looking great! 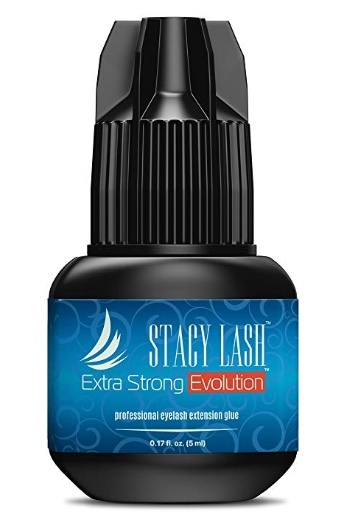 Stacy Lash is a trusted Eyelash brand, and this extension glue is an advanced version of the already great Stacy Lash Extra Strong Eyelash Glue. It has a higher retention, with lashes staying in place for up to 8 weeks, perfect for professional use. The fast dry time of the product, 1-2 seconds, allows for quick application but should be used by skilled lash artists. The lash glue is made with lower fumes and therefore causes less irritation. The short drying time also helps lower the risk of irritation. The adhesive has a low viscosity and high flexibility, making it easy to apply and lessening any clumps or dragging. The elasticity of the product allows it to hold up well under stress, with the structure of the glue remaining intact. For versatility, a reliable hold and stress-free application, this is a great product. It holds up well under any pressure and lets clients enjoy their lashes for much longer. Professional use is a must. The fast drying time of the Pure Lash Eyelash Extension Glue makes it a perfect product for professionals and those who know what they are doing when it comes to lash extensions. The result of the fast drying time is a quick and efficient extension procedure with a strong hold. The Pure Lash Black Label glue has a maximum retention time of between 7-8 weeks, making it one of the longest on the market. To make its retention time even more meaningful, the extreme durability of the adhesive makes it a great product choice for lash extension artists. The design of the packaging was done to make the application easier for customers and to keep the integrity of the product intact. This superb adhesive has everything you might need and want when applying lovely lashes, and offers only the best quality ingredients for both you and clients. 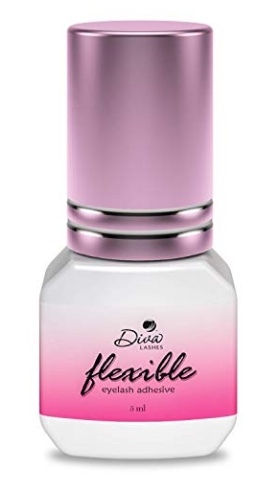 For diva looking lashes, you should look no further than the Diva Lashes Eyelash Extension Glue. It is perfect for use on individual lashes and has been created specifically for this type of application. It has a quick drying time of 1-2 seconds, making it perfect for professionals or those in the know who don’t want to waste any time sitting around waiting for lashes to dry. It has a retention time of up to 6 weeks, giving you a lovely period to enjoy your luscious lashes. It has minimal fumes, so it should not cause irritation to most users. The glues dries black, allowing the lashes to blend in naturally with the natural lashes, and giving it an extra bit of volume as well. The viscosity of the adhesive stops clumping and dragging, and makes it really easy to apply and maneuver. This eyelash extension glue is a great all-rounder and is made by a really reliable brand. It will be one that both you and clients enjoy using, for long-lasting, perfectly natural looking lashes. 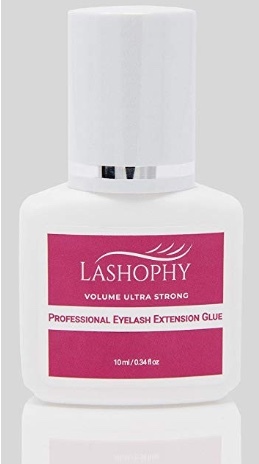 The Lashophy Extension Glue will really help you set yourself apart, not only with an easy and reliable application, but with long lasting and natural looking lashes. This adhesive is a great choice for semi-permanent lashes and works well when applying individual lashes as well. The adhesive allows you to create full-bodied lashes which will stand out in a crowd. The set time for the adhesive is approximately 2-3 seconds, so it is fast, but it still gives you some time to adjust if needed. The double blocking nozzle stops leakages and wastage, and keeps the integrity of the product safe, stopping it from hardening when in contact with air. With a retention time of up to 6 weeks, the lashes are long lasting but comfortable as well. To make the product even handier, it is universally compatible with individual lashes so you can customize your application to suit you. The product is also latex free, avoiding any irritation to normal eyes. The Lashophy Volume Ultra Strong Professional Eyelash Extension Glue is a must for those looking for a reliable and long-lasting product that can be used across a range of different individual lashes. It gives you the freedom of choice, with reliable and flawless results.